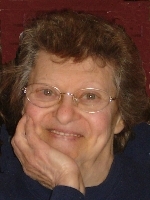 ALBANY – Frances U. Allen, 77, of Albany, while surrounded by her loving family was carried to heaven in the arms of the angels on Tuesday, June 8, 2010. Born August 25, 1932 to Biagio Burometto and Angela Papa, the youngest of six. Fran grew up and attended school at St John’s in the Albany South End fondly known as “Little Italy”. She began her love of people while helping to run her father’s store, “Burometto’s Food Mart” on Green St. She met and married her one and only love, Kenneth Allen in 1952 and rejoiced in the birth of their only child in 1957. During their life together they bought and operated the former “Hide-a-way” on Rt 4 in East Greenbush until Ken’s tragic demise in an automobile accident in 1960. Being the strong woman she was, Fran picked herself up and went on to build a wonderful, fulfilling life for herself and her daughter. Prior to her retirement Fran worked as a manager for the IRS in Latham. After retirement Fran’s management abilities branched out to benefit her church, All Saints Catholic Church (the former St Margaret Mary’s) in Albany. There Fran organized the very first garage sale which over the years blossomed into one of the biggest financial aids to the church community. She was also proud to get her beloved “Granny Squares” off the ground. These remarkable women have outfitted numerous needy groups around the city with sweaters, blankets, hat, mittens or anything requested. If it could be crafted, her “Granny’s” would figure out how to get it done. Even during her illness she was so happy to know her “Granny’s” were going strong and would long after she was gone. Left to mourn her departure are her daughter Barbara and her son-in-law Art Dougall, who no matter what could make her laugh even at the worst of times. Her two granddaughters Angela and Lindsay whom she really believed the world revolved around. And the other important “little man” in her life, her great-grandson Kenny. She is also survived by numerous nieces, nephews and extended families. Fran was predeceased by her brothers Frank (Tony), Vincent (Jimmy), Charles (Charlie), Mario and one sister Mary Robelotto. The family would like to send a special thank you to her friends Kay Shaughnessy, Terry Girzone, Lois Leikhim and countless others whose visits throughout her short illness kept her spirit strong. Right up to the day she passed she looked forward to all the cards, calls and blessings she received. Also, a special thanks to the on-call nurses at the Community Hospice who offered their support during the difficult times, but mostly to her nurse Bernadette, and her caregiver Tiara who treated her with such tender, loving ways the family will be forever grateful. In keeping with Fran’s giving ways, she has made an anatomical gift to Albany Medical College therefore there will be no viewing. In lieu of flowers Fran has asked donations be made in her name to The Community Hospice of Albany, 445 New Karner Rd., Albany, NY 12205. A memorial mass will be celebrated at All Saints Catholic Church on Homestead St., Albany at 9:30 AM on Saturday, June 12, 2010. Immediately following will be a “Celebration of Life” at the Italian American Community Center. All are invited to attend and share stories of this incredible woman. Interment of Fran’s ashes will be at a later date beside her husband at Calvary Cemetery in Glenmont. To leave a message of condolence for the family, please visit www.HansFuneralHome.com . My thoughts and prayers are with the Dougall family during this tough time. I met Fran a few times, and all the times I was with her she had me laughing. She will forever be in my heart and I will always cherish the moments that I spent with her. She was a sweet, caring, loving and wonderful women who will forever be missed but not forgotten. Fran’s obituary is the perfect description of her life lived to the fullest, not dwelling on the past or on sadness, but focusing on the pleasures and gifts bestowed on her. Fran especially treasured her family for whom she was forever proud! And if her family made her laugh Fran did that equally as well in return! We pray that those left behind can find comfort in the wonderful memories shared by all on so many special occasions. For that we are all thankful! Sincerest sympathy. I know for certain that we never lose the people we love, even to death. They continue to participate in every act, thought and decision we make. Their love leaves an indelible imprint in our memories. Fran was a Light to many of us. Such a nice tribute….Although we were only acquainted a very short time–I suspected there was a lot more to Fran than I was seeing then. Frannie babe is in heaven now with all her loved ones. We will miss her dearly, but the type of person she was would want you to celebrate her life after passing. My heart is broken. I will miss her e-mails and chats fro time to time on the phone making sure everyone was doing well. Grammy fran you will be missed more then you know. I too worked in Latham at the start of my 20 + yrs at IRS. although she was not my manager I have fond memories of my interactions Fran. May her soul rest in peace. I worked with Fran in Latham, IRS – We shared many good laughs with each other. She will be with several Friends in Haven, and she will be another bright star in the sky above. May she rest in peace with the Lord. I remember Barbara telling me stories of her mother and her strength, independence and humor. She was certainly a remarkable and wonderful woman. Our deepest sympathies to Barbara and family.